This guide has been updated on January 3rd 2019. Are you tired of stirring in the middle of the night, only to find that your traditional feather filled pillow has fallen flat? Do you wake up in the morning with a stiff neck and sore upper back, feeling unrested because your head isn’t being adequately supported? For those of you suffering from these pillow-related issues, we’ve created a guide to help you find top rated memory foam pillow for your specific needs, and the many reasons why switching to them might lead to a more comfortable and overall better night’s rest. 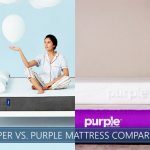 While there are many options in stores and online for you to choose from, the concept of using memory foam products that react to your body temperature and conform to your unique shape has quickly caught on. Understanding this shift from down pillows to memory foam is the first step in determining why it may be time for you to ditch the feathers. Thickness: 4.5" or 6" or 7"
Thickness: One side is 2.75" and another is 4"
Thickness: One side is 4" and another is 5"
You are now armed with a firm grasp on all things related to the memory foam pillow. This still begs the question of which one is the best choice for you long-term. Below are our eight favorite memory foam pillows on the market today, all with unique attributes for you to consider. This is arguably the best-shredded option on the market. Part of their appeal is that they are extremely customizable regarding firmness and loft. This is made possible by its zippered inner casing that can be opened and filled with the desired amount of shredded foam. The shred is made from premium grade proprietary foam blend, according to its manufacturer. What’s more, refills for these shreds are readily available, adding to its increased hypoallergenic design. Another hypoallergenic feature is its removable cover, which makes for easy routine cleaning. Complete with its tightly woven inner case, this is one of the more allergy-friendly options you’ll find. This cover is made up of 60% polyester, 40% bamboo-derived rayon, and is intended to keep the pillow cool throughout your sleep. There are very few foreseeable issues with this choice. One of the few complaints is that it may take a while to get used to. Being that memory foam is quite a contrast to traditional feather pillows, uncomfortableness is very common for the first week or two. However, once surpassing the threshold of the first few uses, the pillow becomes quite enjoyable. The only other problem with this option is that it is very much unlike other memory foam options, in that it is much softer. 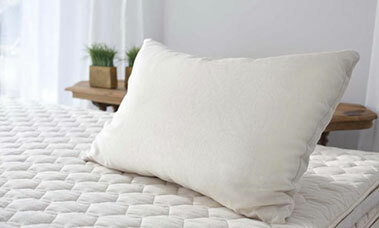 When buying a good memory foam pillow, many tend to assume that they will be firmer. With shredded foam, however, the product is noticeably softer, but for those looking to enjoy the benefits of memory foam while still appreciating “fluff,” this is an excellent choice. Want to learn more about this product? Read the full review here. The Snuggle-Pedic considers itself to be comparable to a down pillow that never goes flat. While this is the same feature among memory foam pillows, this brand has won notable favor among consumers. Like other shredded foam selections, it offers the ability to customize height and firmness by giving you the opportunity to increase or decrease the amount of shredded foam within. The shredded foam in encased by an inner cover and further insulated by the breathable and machine washable outer cover. 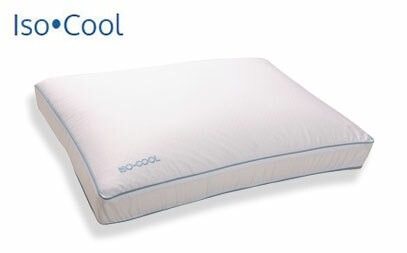 This outer cover employs Snuggle-Pedic’s Ultra-Luxurious Kool-Flow™ Micro-Vented Bamboo Cover, that helps to increase breathability, lending to a consistently cool pillow. Want to learn more about this product? Read the full review. This is an excellent option for those who often travel, as it’s a bit smaller than most of its kind, but it certainly can make for a very comfortable at home option. It is designed with rounded edges, giving it the look of a classic feather pillow with the firm support of 100% polyurethane foam. The outer casing consists of 75% polyester and 25% rayon from bamboo, making it yet another appealingly hypoallergenic selection. Being that this is a mid-size option offering medium firmness, there are not very many complaints. Some people find it too big for travel, while other posture that it might be too small to sleep on. Some consider it too firm for their taste while others prefer an even firmer option. 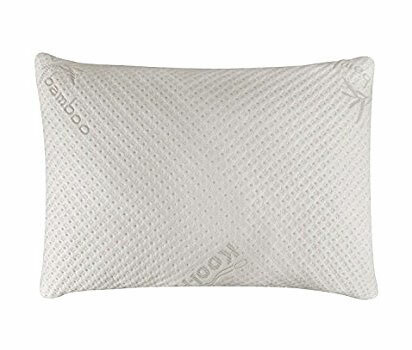 Overall, for those who travel regularly and are in need of a memory foam pillow that is smaller than the standard size, this is a great choice. This pillow is created by SleepBetter, and employs 100% Visco-elastic foam Active Air Technology™ that allows for better airflow, leading to a cooler night’s sleep while still benefiting from the supportiveness of the foam. It is a gusseted design, which means that it is made with extra material at its sides, which is meant to increase its thickness. Its form also consists of microscopic Phase Change Material beds that adjust to regulate body temperature throughout the night. While many who purchased it in the past have thoroughly enjoyed it, many who have recently chosen this option find it to be of lesser quality than in prior years. Whether this is due to manufacturer malfunction is unknown. This is the ideal choice for those who regularly sleep on their side. As previously mentioned, side sleepers should aim to rest their head in the “neutral” position, which is when the neck and spine are comfortably aligned. Elite Rest strives to excel at providing this specific support. 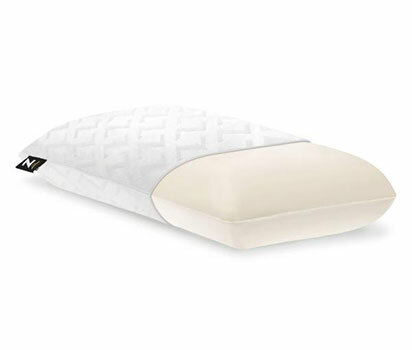 A significant feature of this contour pillow is its different heights at each end. At one end, it is 2.75 inches tall, and at the other end, it reached 4 inches, providing the utmost in customizable comfort for your neck and spine. The most commonly found issue with this brand of contour pillow is its small dimensions. Many have found it to be smaller than expected and too small to fit their specific body type. Anyone who is above average in height or weight may experience dissatisfaction. While this pillow is advertised as having medium firmness, many have noted that it is one of the softest the memory foam pillows. If you’re looking for a firmer feel, this may not be the ideal pick for you. 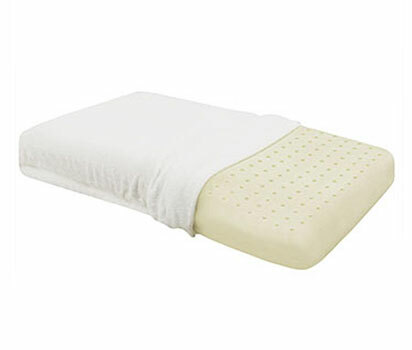 This option is of the more traditional memory foam pillow and is ideal for many different sleeping habits. With a 5-inch loft, this pillow is one of the taller of its kind, make for an increasingly supporting choice for both back and side sleepers. What is unique is its aerated memory foam design, which is created with a pattern of holes to keep your head cool while providing ventilated neck and head support. This idea of ventilation for memory foam has increasingly become one of the more important factors, and conforma has taken note with its revolutionary design. Conforma also prides itself on its “next generation” foam, complete with cooling properties that allow for self-ventilation. This aerated design aims to dissipate body heat and allow air to travel through the material. This pillow advertises to be helpful to those with several health concerns like acid reflux and back pain. It provides a slight incline to the upper back and head area. By harnessing the force of gravity, this pillow supposedly keeps acid in your stomach, rather than coming up through the esophagus and causing acid reflux. Especially for those who are pregnant, this is touted as a life-saver (read our full buyer’s guide to pregnancy pillows). As with many wedge pillows, there is much debate on whether this offering employs the optimal incline for a comfortable sleep. Many who purchased this pillow found the incline to be too steep while noting that the quality and firmness were supreme. 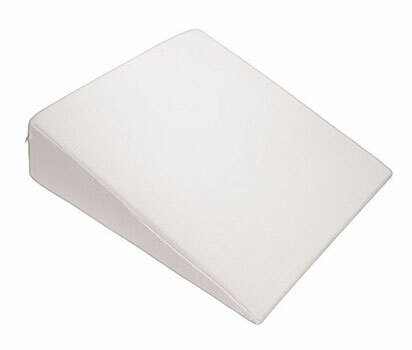 This product is the most unique among top-rated memory foam pillows. It has all the benefits previously noted for the more traditional contoured style, with the potential added benefits of cooling gel top which serves to reduce heat during your sleep. 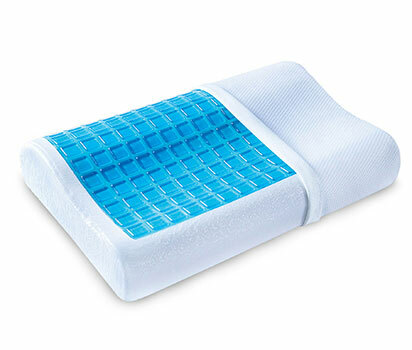 With one side of this gel memory foam pillow being 4 inches and the other side at 5 inches, this pillow is ideal for almost every side sleeper. Again, the contouring of this product allows the sleeper to experience the comfort of an aligned spine, neck and head. The only noteworthy problem found with it is the lingering smell. While many memory foam pillows give off a chemical smell during the first few days to a week, this pillow, in particular, has a lasting stench that for many, does not seem to dissipate. There are several reasons why so many people have opted for foam over the more traditional options. For some individuals, particularly those who sleep on their backs, feathered options may be practical, as back sleepers require minimal neck and head support. However, countless others, notably those who sleep on their sides, have found ample satisfaction after deciding to toss out the goose-down and pick up the foam. For many years, pillows have been filled with duck and goose feathers that, while soft in the beginning, compress throughout the night, leaving your head to rest on a flatbed of fluff. This lack of support found with down pillows has led some traditional users to experience unsavory health complications. Specifically, for those who mainly sleep on their sides, it’s common to experience stiff necks each morning due to improper alignment of the spine. There are many side sleeper options on the market, and many of them are foam based. The optimal position for the neck during rest is what experts call the “neutral” position. This is when that natural curve of the neck is at the perfect and comfortable angle, so as not to overly bend or compress the joints. For this ideal alignment of the neck to occur, it’s best to find one that is thick enough to allow your head to rest gently and evenly within the “neutral” position. If you have suffered from allergies for a long time and have yet to come across any form of relief, the problem may be resting beneath your head. 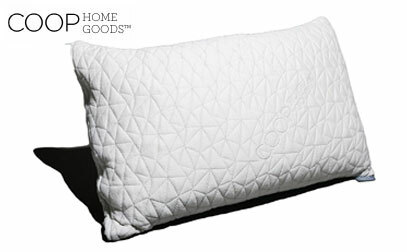 Traditional goose-down, duck feather, and even synthetic pillows have been widely known to cause allergic reactions. These tiny beings, combined with your sweat as you sleep make for a hotbed of bacterial growth that leads to problems with allergies. As if that weren’t bad enough, Jeffrey C. May, of May Indoor Air Investigations in Cambridge, Massachusetts, postulates that, for allergy sufferers, these traditional pillows are causing severe health risks. He equates sleeping on feather filled pillows to having a life bird in your room. He offers many solutions, such as periodically throwing your pillow in the dryer, and avoiding going to bed with wet hair. By far the most long-term and optimal solution is to opt for a safer and more hypoallergenic option, like the memory foam filled pillow. The main reason to switch to a different pillow is to ease neck pain. Another reason to think about switching is that Cervicalgia is the cause of many more serious health issues over time. While this pain can be the result of many factors such as car crashes, sports injuries or genetics, using the wrong neck support for these pre-existing conditions only serves to exacerbate the problem by inflicting tension and stress on the neck and back. It is imperative that your neck and head are elevated to a specific height when trying to alleviate neck pain. Memory foam pillows are a way for you to accomplish this because polyurethane is specifically designed to provide elevated support and a “melting in” feeling that adds to your overall comfort. In addition to the traditional feather offerings, there are several other styles offered that could be your answer. You’ll find that water and even buckwheat models are being sold as solutions to common ailments related to less than satisfactory pillows, neck pain or allergies. However, there are specific features and benefits found with memory foam that are unlike any of the other choices. 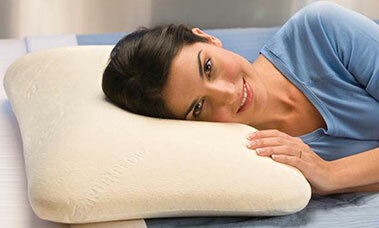 The most highly recognized benefit of owning a memory foam pillow is its ease of motion transfer resistance. While first receiving recognition using its counterpart, the memory foam mattress, this technology enables the cushion to essentially build a mold around your head for optimal head and neck support. This benefit is also known to lead to a reduction in snoring thanks to foam keeping the neck aligned and air passages open. 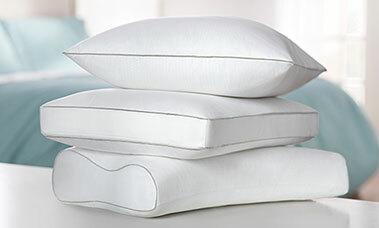 Unlike the feather filled pillows, memory foam does not lose its shape over time. There will never be a need to “fluff” this type because it is designed to, as stated before, resist motion transfer. They are made primarily from polyurethane, and material specially manufactured to keep its form for years to come, which also lends to the products longevity versus traditional ones that should be replaced roughly every 1 to 3 years. It’s important to note, however, that (as you’ll read) some of the shredded foam choices have the propensity to lose shape gradually over time and may need some fluffing or re-shaping. While there are very few issues found by those who have purchased memory foam pillows, it’s important to consider the few problems that have been regularly highlighted by consumers. And our guide to memory density may be a helpful resource for you as well. While many traditional offerings can be purchased for a relatively inexpensive price, these are one of the most expensive options found on the market. Some can cost upwards of $100, while other neck support products such as water pillows, land at roughly the midpoint regarding pricing, ranging from $40 to $60. Ultimately, it is at the user’s discretion, the value placed on consistent, comfortable rest. Much like it’s counterpart, the memory foam mattress, this polyurethane material that’s used is known to retain heat throughout the night. Although this has been a frequent complaint in the past, there have been a few techniques outlined in recent years that aid in the cooling of memory foam. While most tips are offered to help relieve you of the potentiality of uncomfortable heat retention of your mattress, many of them can be applied to your pillow as well. One of the most commonly discovered issues is the unpleasant chemical smell that accompanies it for the first few days or even a couple weeks. With virtually every option on the market, this scent will imminently be an immediate deterrent. However, if you let it air out each day and practice patience, it often goes away with time. Now that you are aware of the pros and cons, it’s good to look at the different subcategories and their unique features to determine which of these options is right for you. The most commonly purchased option is the traditionally shaped pillow. This version is elementary; a piece of this foam that is cut to the shape specifications of your cover. At first glance, you’d probably dismiss it as feather filled, as it’s just a rectangle with a cover on it. It is cut into a more specific shape, and it uniquely crafted to cradle your head at just the perfect angle. With the aim of providing ideal support for the head and neck, you’re likely to experience maximum results regarding neck pain relief. 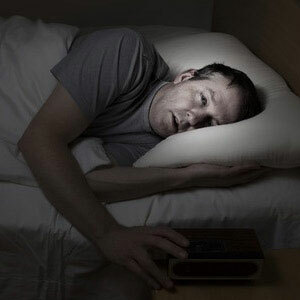 However, this type is not favored among those sleepers who tend to move regularly throughout the night. This model is commonly only comfortable in certain positions. Those who sleep on their stomachs will find this pillow unpleasant. This exciting option is similar to the traditional option in that; it is shaped much like a pillow filled with feathers. However, its contents are made up of thousands of shredded pieces of memory foam that are tightly compacted together. This option is growing to be increasingly more popular, as it’s shredded interior provides more breathability throughout the night, leading to less heat retention. Additionally, by squishing it, the loft and proportion of stuffing can be adjusted to the desired form. This shape and style are the most unique of the four offerings. Mostly, it is a large triangle that is made from a single slab of memory foam. While it is not primarily used in sleep situations, it has many practical applications for your health. This is a great pillow for use when reading, while pregnant or for those with respiratory problems. If you are a side sleeper, you may greatly benefit from the contoured style. For many who sleep on their backs or stomachs, this is not the most suitable pick. If you are pregnant or experiencing gastrointestinal or esophageal related health concerns, the wedge memory foam pillow may be ideal. However, if you find the incline or firmness displeasing, you might be better suited for a classic style or shredded memory foam pillow. Whatever your individual sleep needs may be, there is absolutely the best memory foam pillow out there for you. If you’re still unsure, Iso-Cool is our favorite pick so make sure to check it out. are foam pillows suitable for people with latex allergies? Yes, I know one person with latex allergies and she uses a pillow with shredded foam without any issues. 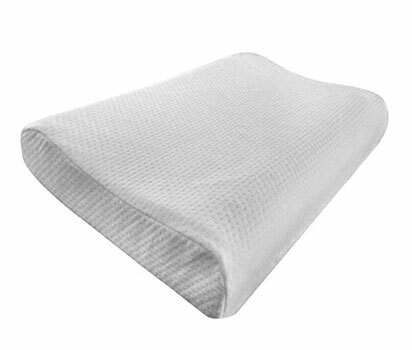 I have a Shredded pillow that gives me a great night sleep, so supportive and comfortable. But recently I read that the chemicals in these pillows are very dangerous? Is that valid or not? My pillow is made of Polypropeline. Hey Laurie, I will double check on all that, thanks for your comment! Outstanding article. But can’t agree more that shredded memory foam pillows are one of the best and it will adapt to your shape really quickly and comfortably.